Curious about humans & how things work. I always wanted to do things differently. 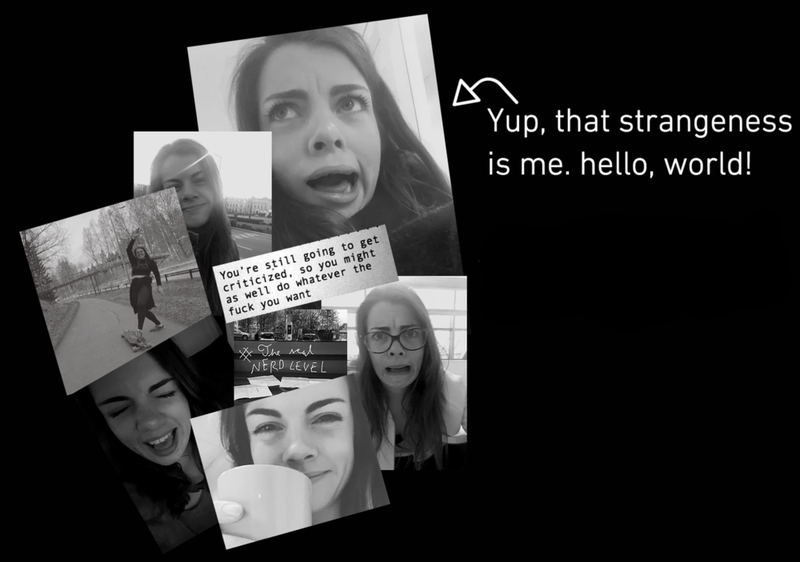 Hey, my name is Vilde & this is your chance to learn more about me. IF YOU WOULD LOOK AT MY RESUME. WELL... YOU DISCOVER THAT IT'S NOT A TRADITIONAL ONE.TYPICAL HAS NEVER BEEN MY TARGET: CURIOSITY IS CRUCIAL TO ME! WHEN I WAS 14 I STARTED TO DESIGN MY FIRST WEBPAGES ! The creative world had me hooked. I would play around with everything from photography, blogging, clothing design, designing all kind of graphic things, drawing, writing a book, writing a diary, I would read a lot, making video-sketches with friends and just do all kinds of goofy stuff. I did not know then that all that FUN was work that would bring me to the place I right know. I explored many formats and wanted to develop my skills and learn new cool stuff. TODAY I STILL LOVE TO PLAY AROUND IN THE FIELDS OF CREATIVITY. TO EXPLORE HOW I CAN MAKE THINGS HAPPEN & LIVE OF THAT CRAZINESS. In 2012 I co-started my first youth business. I am the founder of Vilde Media since 2014 & co-founder of the organization Young Sustainable Impact (www.ysiglobal.com). In 2016 Young Sustainable Impact (YSI) gathered 20 people aged 16-20 from 16 different countries to address climate challenges through entrepreneurial solutions. Now in 2017, we had over 10 000 people from 160 different countries who applied to participate in YSI 2017. I believe that competence is something you not get, you build it through experiences. ADOBE PHOTOSHOP // ADOBE INDESIGN // ADOBE ILLUSTRATOR // ADOBE BRIDGE // CAMERA RAW // FINAL CUT // I-MOVIE //ADOBE PREMIERE // KEYNOTE // POWER POINT // CANVA.COM // PAGES // MICROSOFT OFFICE // GOOGLE DRIVE //SLACK // WORKPLACE. RUNNING FACEBOOKPAGES // GRAPHIC POSTER DESIGN // EVENT-PHOTO // FASHION PHOTO // PRODUCT PHOTOGRAPHY // NATURE PHOTOGRAPHY // PROJECT MANAGEMENT // MENTORING // COACHING // PUBLIC SPEAKING // HOSTING WORKSHOPS // EVENT MANAGEMENT & PLANNING // LEADERSHIP // SOCIAL MEDIA DISTRIBUTION // CONCEPT DEVELOPMENT // UX-DESIGN // PRESENTATION DESIGN // PITCH DESIGN // CAMPAIGN MANAGEMENT // & MORE.